In April 2010, David Byrne (leader of the former cult rock-band Talking Heads) released Here Lies Love in collaboration with Fatboy Slim. 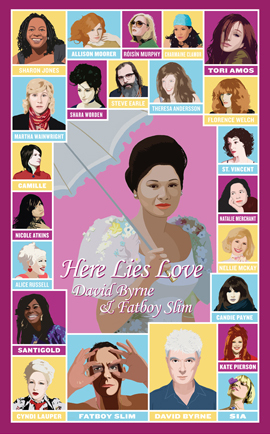 A song cycle about the life of former Philippines president’s wife Imelda Marcos, Here Lies Love features numerous guest singers (mostly women) singing the parts of Imelda and her entourage. Among the most renowned artists invited by Byrne we find Martha Wainwright, Florence Welsh (Florence and the Machine), Natalie Merchant, Camille, Santigold, Cindy Lauper or Sia. Tori sings on two tracks : "You’ll Be Taken Care Of" (she sings the whole song) and "Why Don’t You Love Me ?" in duet with Cindy Lauper. Despite comparisons to Andrew Lloyd Webber’s musical Evita, Here Lies Love is quite critical of Imelda, even though some journalists didn’t seem to notice it. We see most of the story through her eyes (except a few tracks sung from another point of view and which highlight more directly the dark aspects of her personnality) but the lyrics sound more and more ironic as she appears as a self-absorbed woman, obsessively narcissist to the point of becoming megalomaniac (she thinks of herself as the Great Mother of the Philippines people while she and her husband hijack the funds of the country; she invented her own delusional cosmology from her flower paintings…). David Byrne is sometimes sympathetic to her, mainly on the first disc of the double-album, when she slowly rises from poverty then has to deal with her patronizing husband who controls everything in her life and pays people to teach her how to walk like a ’real woman’ but he doesn’t close his eyes on Imelda’s personal involvement in her husband’s politics (she was a diplomate and minister of his government, among other things) and how she acted as a ruthless and cruel woman while, on the other hand, she was able to spend a lot of time raising funds for orphanages and hospitals. She appears, not as a mere caricatural Lady McBeth sending to death her former lover (Ninoy Aquinos, an opposant of her husband, assassinated on the orders of Imelda herself) but as a paradoxal and complex human being. She becomes more and more grotesque in the way she pictures herself and her glamourous life (which is emphasized by the very 70’s-80’s disco music of the record which Imelda loves) but she remains an intricate being, both fascinating and repulsive. On his official website, David Byrne explained that he was fascinated to see how the politics of the Marcos dynasty, in which Imelda played a major role, were in part defined by the will to mend her unhappy past (she spent an awful lot of money in clothes and various expensive projects, which amounted to a 28 billion dollars loan contracted by the country for the year of 1985 only). "The story I am interested in," writes David Byrne on his website, "is about asking what drives a powerful person-what makes them tick ? How do they make and then remake themselves ? I thought to myself, wouldn’t it be great if-as this piece would be principally composed of clubby dance music-one could experience it in a club setting ? Could one bring a ‘story’ and a kind of theatre to the disco ? Was that possible ? If so, wouldn’t that be amazing !" Tori’s vocals for the two tracks she appears in were recorded at her home studio, Martian Engineering, in Cornwall. While she visited Undercover.com in November 2009 for the promotion of Midwinter Graces, she confessed she was amazed David Byrne came on a train by himself and didn’t act like a rock-star at all. "I’m such a big fan and the thing is working with him was just a blast because what I love about him… Yes, he is another legend and I’ve worked with some amazing ones: Robert Plant, Peter Gabriel… and they’re great as well. (…) And David, he seems so unaffected by the fact that he’s a legend. He goes about his life, he’s very funny, and if he walked in a room, he’s a striking man, but he doesn’t expect to be treated like a rock star. He came on a train by himself. I mean, you know, he’s a really unaffected kind of, down-to-earth guy."